Unbelievably addicting, these are not your usual state fair Fried Cheese Curds. They are crunchier, very flavorful and easy to make at home! All with that melt in your mouth experience you would expect from fried cheese! Today we are taking a break from all the healthy recipes to talk about cheese. And not any cheese – the best kind – fried cheese! Okay, okay. My last Cauliflower Gratin post was full of cream, cheese and bacon, so not exactly what some people would consider healthy. But it had cauliflower, which we already established as the new trend in the healthy world! So that counts, right? But this time I can’t even defend the indulgence of these fried cheese curds. They are EVIL! They look at you like mermaids, singing in a voice only heard deep within your soul, seducing you into eating the whole batch by yourself. Witchcraft? Sorcery? Or just the understandable effect that deep fried food has on foodies? I honestly don’t know! But I feel obligated to warn you. Do not make these if you don’t wanna end up stuffing yourself with cheese. Just kidding! Make them! And eat them all! A little extravagance, here and there, never killed anyone! I had no idea these existed until a recent trip sponsored by the American Dairy Association! We had them at dinner and it was love at first taste. Cheese curds are the by-product of cheese making. They are the curds that don’t make into the mold to create a wheel or block of cheese, usually cheddar. They taste mild, with a slight rubbery texture that should squeak when eaten fresh. Popular in the Midwest, they are strongly associated with Wisconsin, the leading producer of cheese in the United States. There you can get them super fresh, within hours of manufacture. If you don’t eat them within a couple of days or if you refrigerate them, they lose their desirable squeak-able qualities. So the ones you get at the supermarket probably won’t squeak, which is okay if you are going to use them for frying! 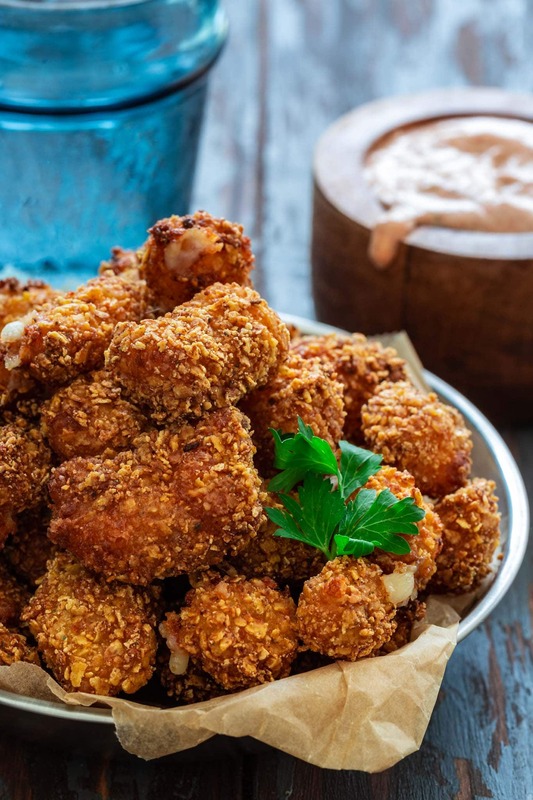 Other than eating them plain and deep frying them, you can dust them with flavorings – like herbs, spices or garlic – or use them for Canadian poutine, which is French fries smothered with cheese curds and gravy. What if I can’t find cheese curds? Can I still make this? Don’t worry! If you can find them, this recipe works just as well with any cheese (something that melts well, like mozzarella or cheddar), cut into cubes. 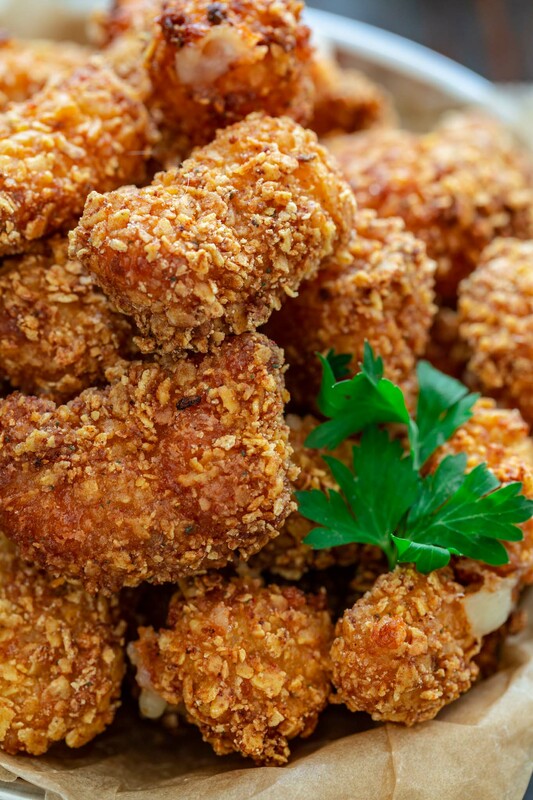 The fried cheese curds you typically find at fairs and festivals, are covered with a batter – similar to the one you would coat onion rings in – and then deep fried. 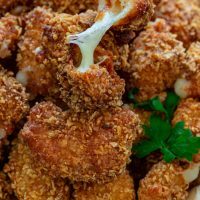 My recipe uses the breading technique instead, giving the cheese curds more crunch in each bite while also producing a golden, flavorful crust. The curd bits are dredged in flour, followed by beaten eggs, and rolled in my extra crispy secret ingredient (more on that soon). After that, I pop them in the freezer for about 30 minutes and they are ready to be fried! Doritos! That’s my secret, super crispy ingredient! You could claim panko would provide similar results, but the corn chips really add extra flavor to the breading. 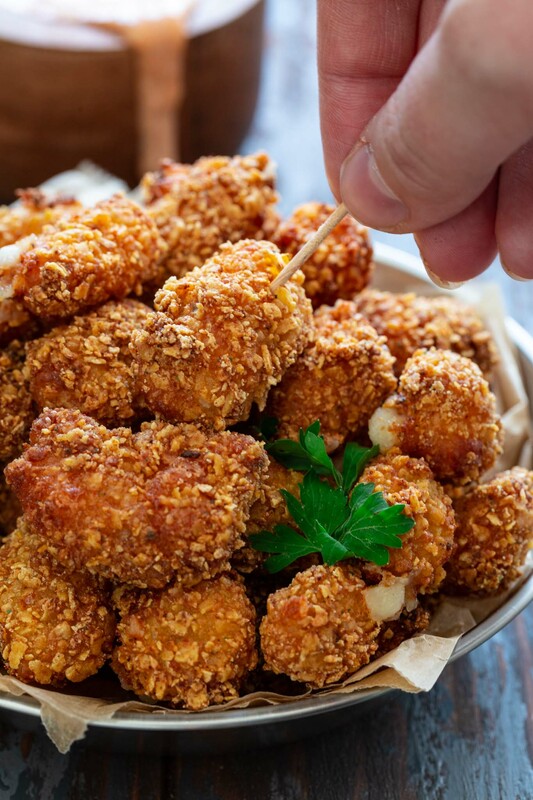 Plus, there are so many flavors to choose from, like Cool Ranch and Nacho Cheese, that you get to customize the coating of these fried cheese curds every time. Even if you’re not a fan of the chips as a snack, you gotta try using them for breading! Trust me. You will be amazed at their crunch power! 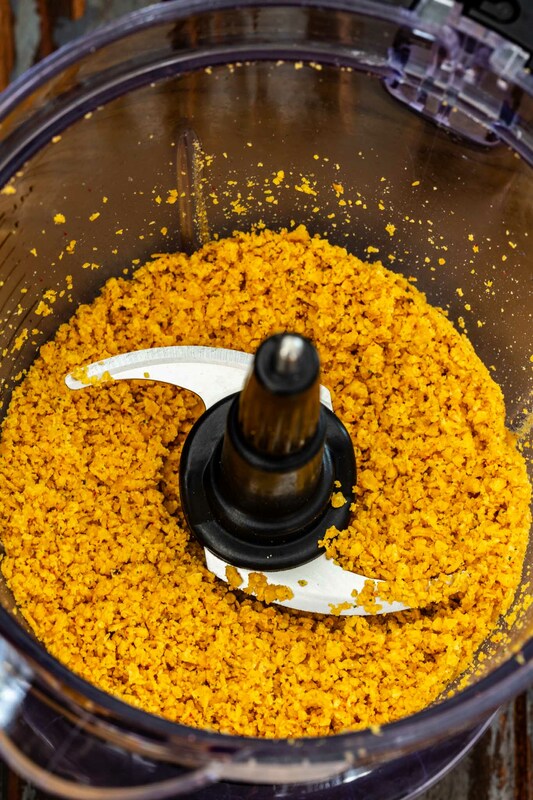 When crushing your chips, you’ll want to use a food processor and pulse until they are crushed quite small, but not powdered, as we do want some texture. Freezing (or refrigerating) after breading is also important, so the breading can stick really well! You do not need a deep-fryer to make yummy fried treats at home! A deep sauce pan, wok, dutch oven or stockpot. A candy or deep fry thermometer. Frying oil with a high smoke point, so it won’t burn under high temperatures. I use canola oil, but peanut or grapeseed would also work! Paper towels to soak the extra grease after frying. Make sure you have enough oil to completely cover the cheese curds. Fill the pot with it and set on the stove, over medium heat. I highly recommend a thermometer so you can track the temperature. When your oil reaches 360°F, gently add a few cheese curds, about 5 or 6 at a time, using a metal utensil to nudge the pieces away from each other so they don’t stick. You want to maintain the temperature of the oil, so it’s important to work with small batches. If you’re working with the right temperature, when the curds start to look golden brown, which will happen after about a minute or two, that means that the cheese inside is melted and you can transfer them, using a slotted metal spoon, to a plate covered with paper towel. You might also see a bit of cheese oozing from some of the cheese curds. That is okay! Repeat with the remaining batches, keeping an eye on the temperature and adjusting the heat as needed. Can I fry these in an air fryer? To be 100% honest with you, I haven’t boarded the air fryer wagon yet! I keep meaning to get one and then end up spending my money elsewhere. However, since I do expect some of you will ask me that question, I asked a good friend of mine, who air fries everything, even eggs! The answer is yes! You can air fry cheese curds. But they have to be frozen before air frying, or they will melt and stick to the basket. Just preheat your air fryer to 400 degrees F, and spray the basket with nonstick cooking spray. Place the frozen breaded cheese curds in its basket and air fry for about 4 minutes, shaking the basket often. I can’t wait to try it! Once I finally get an air fryer, I’ll come back to update this post with my thoughts! 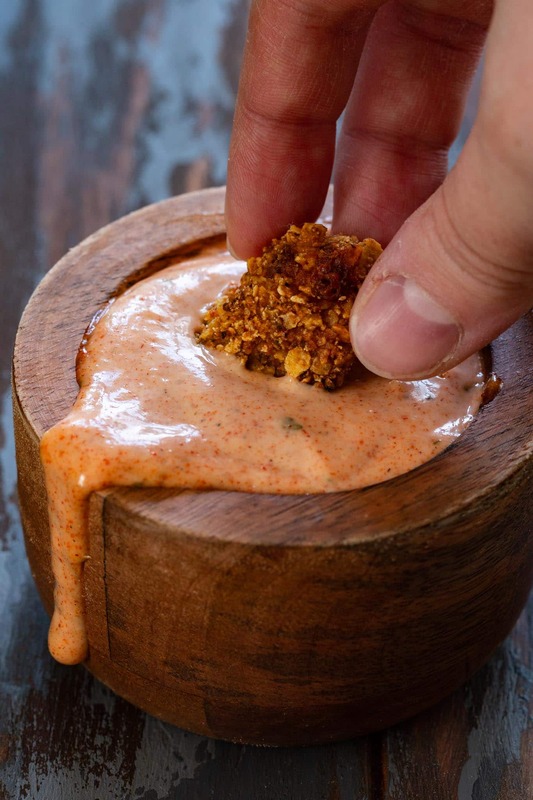 I don’t usually post copycat recipes, but I’m so addicted to Outback’s Blooming Onion sauce that it was the first thing that came to my mind when I was brainstorming a tasty dip for my fried cheese curds! And, boy, was I right! They go so well together. The sauce is just a combination of mayo, ketchup, horseradish, paprika, dried oregano, pepper and salt. It’s slightly spicy, slightly tangy and slightly sweet! Perfection! And if you like it hot, you can always add a touch of cayenne to make it spicier! Gee, this post got long! I could talk about fried cheese forever. Seriously, make these! You can thank me later. Set the all purpose flour, eggs and crushed Doritos in separate bowls. Dip each cheese curd in the flour and then in the eggs. Roll them in the crushed Doritos, making sure to press so every curd is well coated. 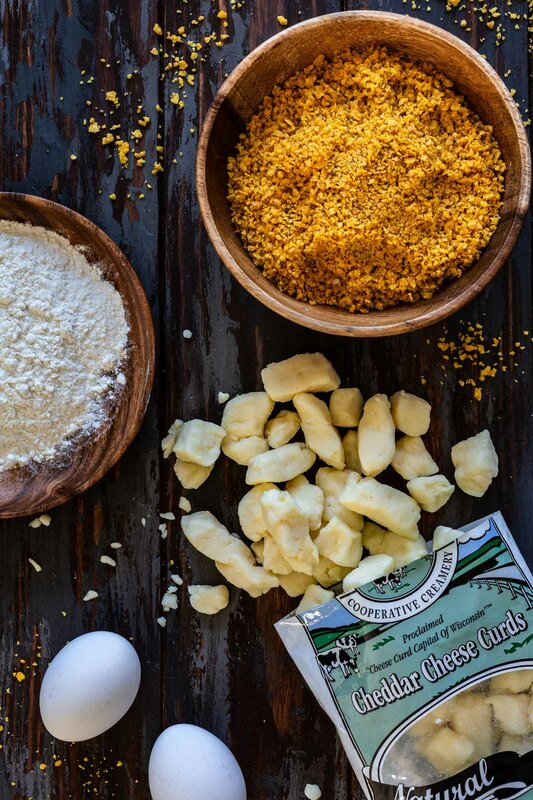 Transfer the coated curds to a baking sheet lined with parchment paper and freeze for 30 minutes. 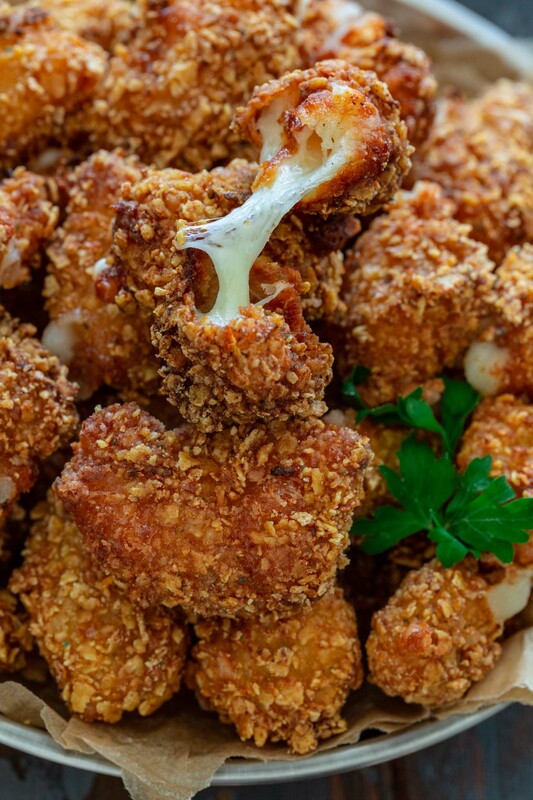 Add enough oil to cover the cheese curds to a large pot and heat it, over medium heat, until a deep-frying thermometer inserted in the oil reads 360 degrees F. Fry the cheese curds for 1-2 minutes, turning halfway through, until golden brown. Place the fried cheese curds on a plate lined with paper towels to soak the excess grease. 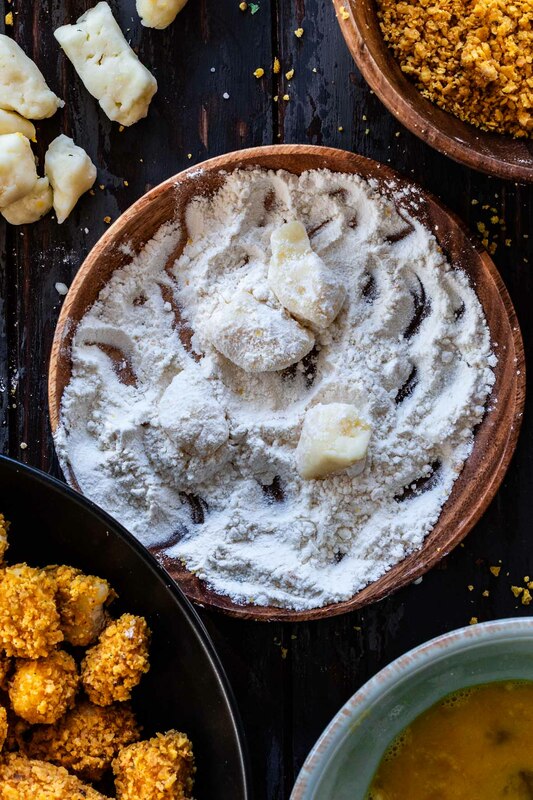 Serve the fried cheese curds with the dipping sauce. Mix all the ingredients in a bowl until well combined. For the best flavor, cover and refrigerate for at least an hour before serving, so the flavors can blend together.